Milka Ternina (born Katarina Milka Trnina (1863-1941) was a Croatian dramatic soprano who enjoyed a high reputation in major American and European opera houses. Praised by audiences and music critics alike for the electrifying force of her acting and the excellence of her singing in both German and Italian works, her career was curtailed at its peak in 1906 by a medical condition which paralyzed a nerve in her face. In 1898, she appeared for the first time in opera in London, performing Isolde in Tristan und Isolde. 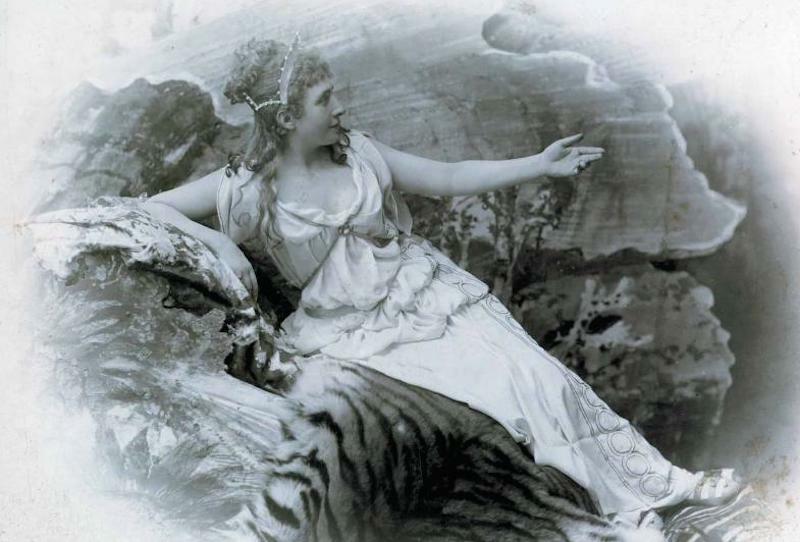 She would continue to appear at the Royal Opera House, Covent Garden, until 1906, achieving a total of 98 appearances there in a variety of operas. Ternina appeared at the 1899 Bayreuth Festival in the role of Kundry in Parsifal. According to Oxford's concise operatic dictionary, this would prove to be her sole appearance at Bayreuth. 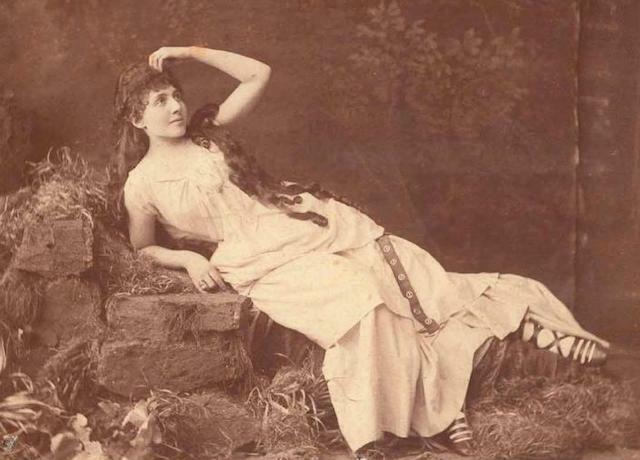 On January 27, 1900, Ternina made her debut at the Metropolitan Opera in New York City as Elisabeth in Tannhauser. During her fruitful association with the Met she sang Kundry in Parsifal's first American performance. Because this staging of the opera was not authorized by the Wagner family, she was never again invited to appear at Bayreuth, despite her stature as an artist. 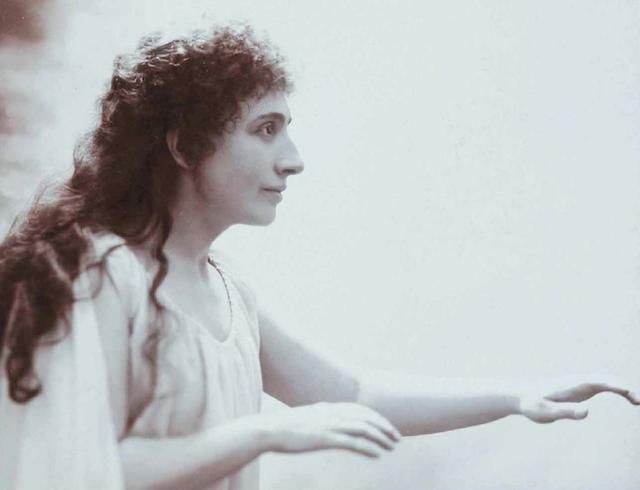 Ternina famously sang the title role in the 1901 American premiere of Giacomo Puccini's Tosca, performing the part at the Met to considerable acclaim on 18 further occasions. The previous year she had been London's first Floria Tosca, too, with the composer, who had been in the audience at Covent Garden that night, describing her interpretation as "ideal". She thus became the English-speaking world's most renowned interpreter of this particular Puccini heroine. In 1906 Ternina suffered an attack of facial paralysis which affected her eye area. The ailment did not yield to medical treatment and she was required to retire from the stage at the height of her powers. For a year she taught singing at the Institute of Musical Art in New York City, after which she withdrew from the international music scene and returned to Zagreb. 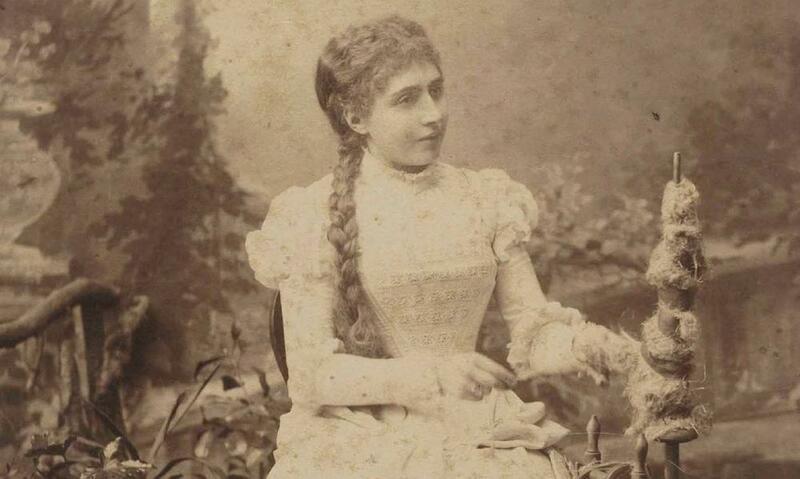 Her best known pupil in Zagreb was the celebrated spinto soprano and Metropolitan Opera star Zinka Kunc Milanov. Ternina died in Zagreb in 1941, aged 77. She did not make any commercial recordings of her voice but fragments of her singing can be discerned on Mapleson Cylinders recorded live at the Met at the start of the 20th century. These are available on a CD re-issue by Symposium Records (catalogue number 1284). According to Giacomo Puccini, author of the famous opera Tosca, she was the best "Tosca" that he had opportunity to listen to (on the London premiere in 1900). Did You know that the name of the famous MILKA chocolate, Switzerland, had been given in honour to Milka Trnina, Croatian opera diva? The founder of the company, who was a great admirer of the singer, decided to name the company and his chocolate by the name of MILKA. Nada Premerl (ed. ): Milka Ternina and the Royal Opera House. Zagreb: Muzej grada Zagreb, 2006. Milka Trnina was friendly with the famous scientist Nikola Tesla, who loved music and had his own permanent box in the Opera. Ternina was among the circle of people who would visit Tesla's laboratory at 5th Avenue in Manhattan, and followed his experiments. Tesla'­s American friend Robert Underwood Johnson5 in his memoirs says that he was once together with Tesla, Mark Twain and Jefferson, and on another time there were also the well-known Kneissl Quartet, the Bostonian conductor of the Symphony Orchestra Wilhelm Gericke and Madame Ternina, the great primadonna. Robert Underwood Jonson (1853-1937), American poet, translator and editor of the Century Magazine, 1873-1909. 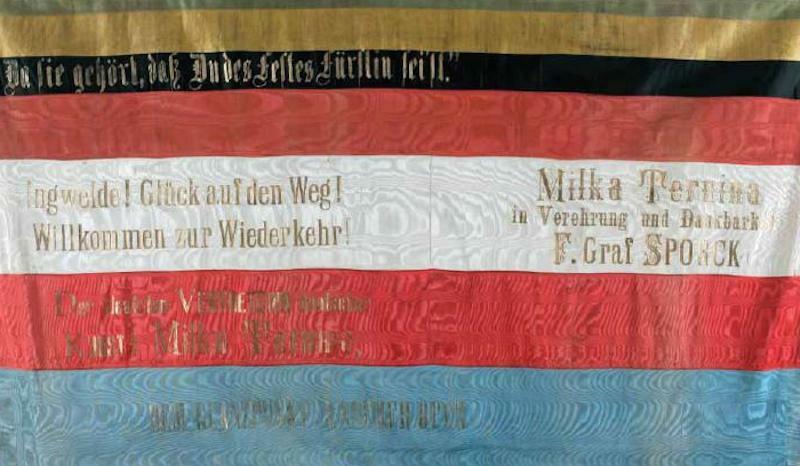 Memorial wreath ribbons dedicated to Milka Ternina with banner gold on silk, woven in German. to perform Isolde's "Love Death", one of the most beautiful arias from Wagner's opera, "Tristan and Isolde". gave her a diamond bracelet. Source www.infozagreb.hr. Croatian soprano, Milka Ternina, was an international star at the turn of the twentieth century. This exhibition, drawn from the Milka Ternina Bequest of the Zagreb City Museum, celebrates Milka Ternina's life, career and long association with London - 100 years after her last performance at the Royal Opera House. Milka Ternina was born on 19 December 1863 in Doljnji Sip, near Vezišće, a small village 50 kilometres from Zagreb, then the capital of Croatia which was part of the Austro-Hungarian empire. Following the death of her father when she was six, Ternina's family decided she would receive a better education and more opportunities if she went to live with her uncle and aunt in Zagreb. 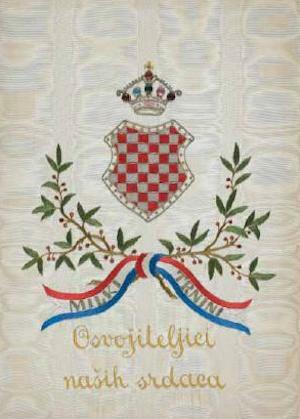 Her uncle Janko Jurković was a writer and government counsellor, who was at the heart of cultural life in the historic Old Town of Zagreb. Following her education in Zagreb, Ternina studied voice at the Vienna Conservatory with Professor Joseph Gansbacher and won the coveted medal for the best student. 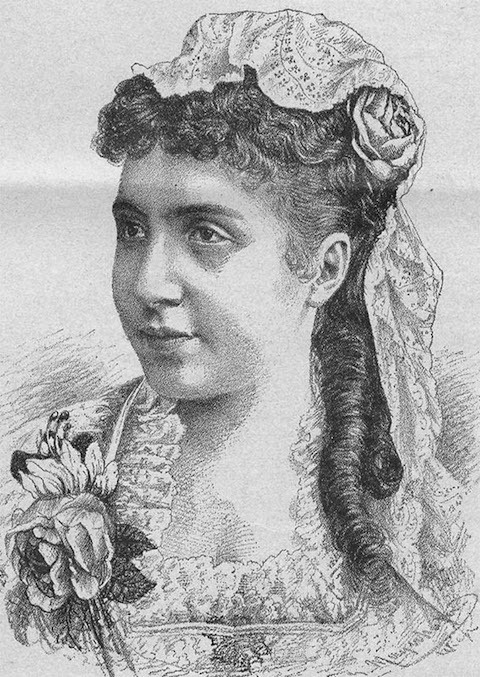 Ternina made her stage debut in Zagreb on 11 April 1882, singing Amelia in Un ballo in maschera (Verdi), the first steps in a career which would see her performing in Leipzig, Graz, Bremen, Munich, London, Bayreuth, New York and Boston. Sadly this glittering career was cut short after little more than 20 years, following complications from an inflamed facial nerve. Ternina returned to Zagreb in 1913, where she lived until her death on 18 May 1941. 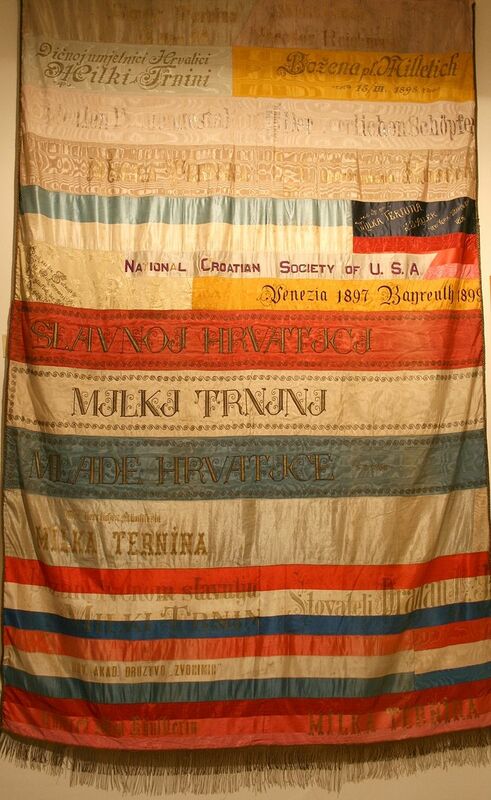 Following her retirement, four of Ternina's costumes were exhibited in the Zagreb City Museum and these costumes along with other memorabilia were given by Ternina to the Museum in perpetuity. For Ternina her costumes were "wonderful memories of artistic work and glory" and she stipulated that "they must not leave Zagreb". Seen for the first time outside of Zagreb since her retirement, it is fitting that they should return, on loan, to the Royal Opera House, a theatre for which she retained great affection. 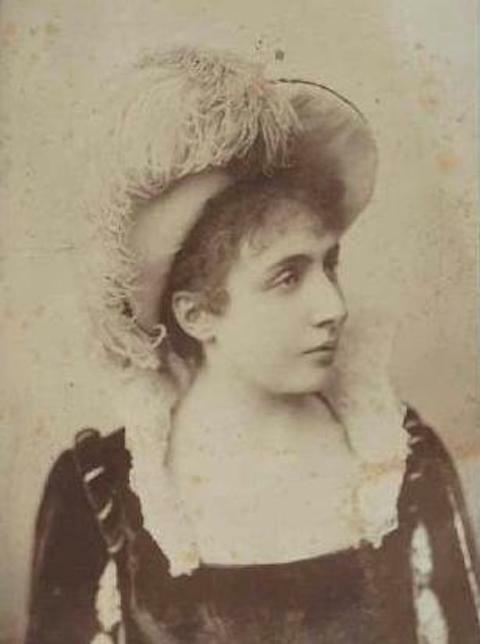 One of the highlights in Ternina's career was singing the title role in Giacomo Puccini's Tosca at its premiere at the Royal Opera House on 12 July 1900. Puccini was in the audience for the premiere and joined her on stage for a curtain call. On display is an affectionately inscribed photograph of Puccini, who later declared that "No other Tosca has ever approached Ternina's". 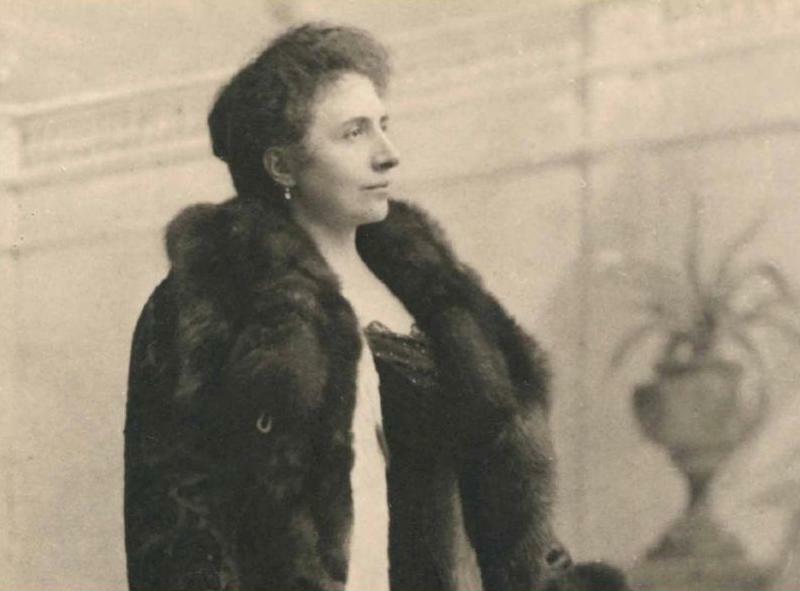 Ternina followed her triumph in London with the premiere of Tosca at the Metropolitan Opera House, New York, in 1901. At this time, leading opera singers travelled with a trunk of costumes. Ternina's costumes were an integral part of her approach to each role, and she took a keen interest in their design and creation. 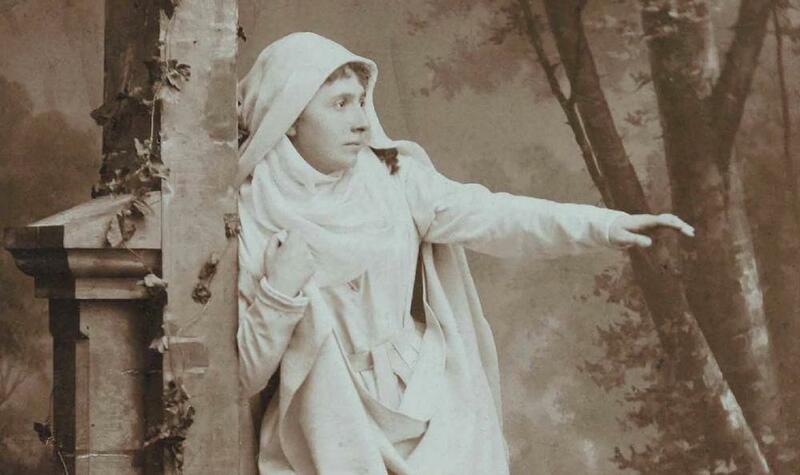 In 1900, she commissioned British artist and costume designer Percy Anderson to design costumes for a range of roles. His attention to detail and harmony of colours had a dramatic effect on stage. Ternina kept 32 of Anderson's exquisite watercolour sketches, which are displayed with the four surviving costumes from Tosca, Tristan and Isolde and Tannhauser, some of the finest examples of theatrical design and craftsmanship from the early 20th century. Made in London, the costumes were lovingly restored by Zagreb City Museum, who found labels indicating that 'Miss Fisher, Theatrical Costumire, 22 Bedford Street, Covent Garden' made the Tosca Act II costume and 'M Nettleship, 58 Wigmore Street, London' made the costume for Elizabeth in Tannhauser. The two magnificent Tosca costumes are in the French Empire style, reflecting the period in which the opera is set. The costumes from the Wagner operas Tristan and Isolde and Tannhauser are in the medieval style favoured by many designers of Wagner operas. 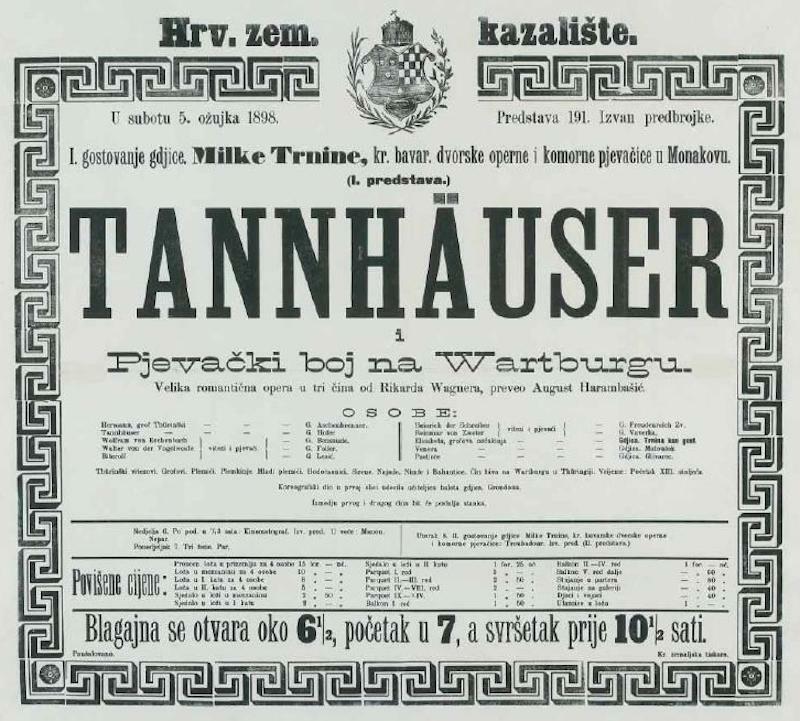 The TannhĂ¤user costume was last seen at the Royal Opera House on 28 August 1906, when Ternina sang Elizabeth, her favourite role, in what would be her final performance here. These costumes can be seen in the Carriage Entranceway and in the Floral Hall. The wall cases leading off the Main Entrance Foyer are devoted to Ternina's appearances at the Royal Opera House and include a selection of Percy Anderson costume designs, photographs, programmes and press cuttings. In the Cloakroom Corridor there are photographs and programmes recalling her life and career, alongside showcases displaying photographs, scores and commemorative items, including some of the silver laurel wreaths presented to Ternina during her distinguished career. Ternina lived boldly for her art, declaring at the end of her life that "Artistic life is difficult and painful, but despite that, if I could live again and could choose, I would choose no other vocation". 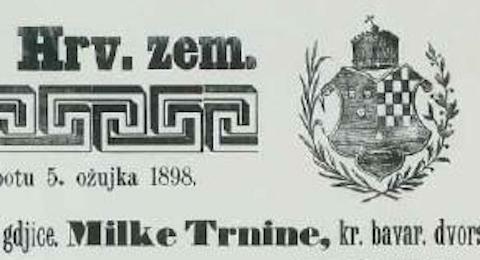 Milka Trnina (or Ternina) was born in Vezišće (Moslavina) on 19 December 1863. 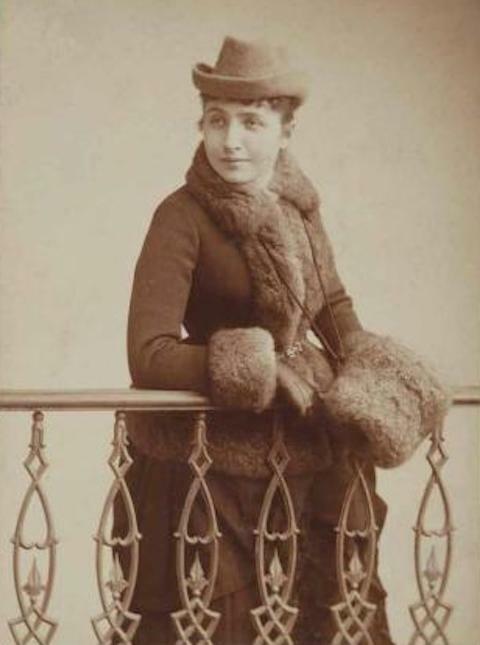 She was Croatian opera artist (soprano), the greatest among a number of distinguished singers whom Croatia gave to the world in the 19th and 20th century. She was celebrated as one of the greatest singers of her time, with beautiful, powerful and carrying voice and perfect singer's technique, of gracious scenic appearance, noble face and - especially pointed out - unique, magic acting. In the history of world opera art, known as "legendary Ternina", she is still referenced in all encyclopaedias. Born as miller's daughter, she became world famous due to her great talent, her God-given voice, diligence and excellent education. As a girl, she came into the house of a relative and writer Janko Jurković in Zagreb, where she received her first music lectures from Ida Wimberger. 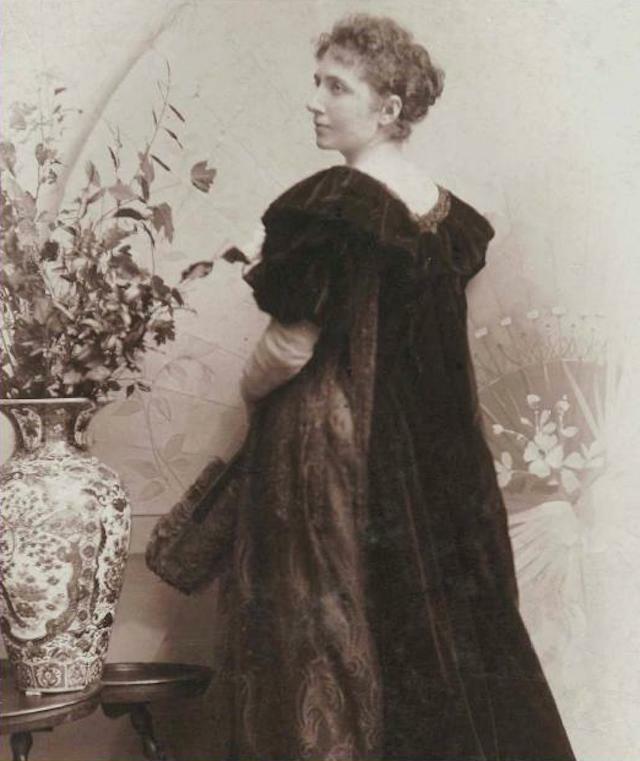 Then she left for Vienna to study at the Academy with Joseph Gansbacher, at that time the best teacher of singing. 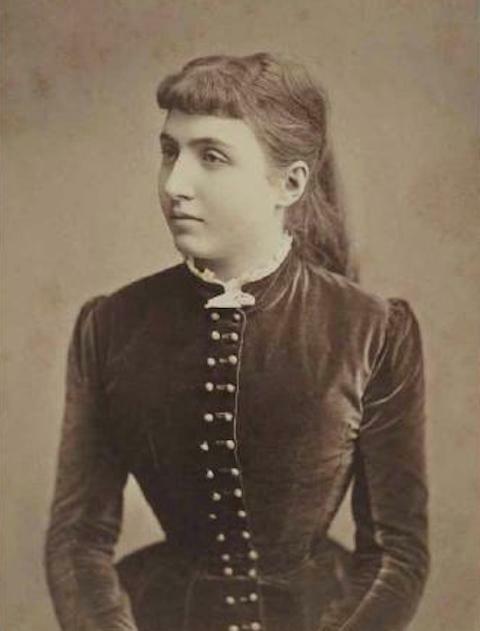 Already as a student she sang at concerts in Vienna, Zagreb, and in Varaždinske Toplice since 1879 and her first opera performance was in Zagreb, the role of Amelia in A Masked Ball (G. Verdi) in 1882. There followed permanent engagements in leading opera houses in Germany and in Austria: Leipzig (1883-1884), Graz (1884-1886), Bremen (1886-1889) and Munich (1889-1899). In Munich she was honoured with the title "royal Bavarian chamber singer", words that are written also on her tomb at the Zagreb cemetery Mirogoj. She sang also in Bayreuth, Prague, Moscow, Zurich, Zagreb and USA and was most admired in the Royal Opera Covent Garden in London and in Metropolitan Opera in New York. 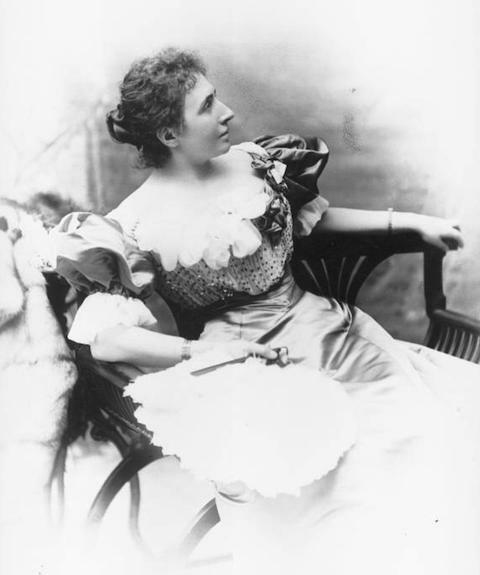 In London and in New York she participated in their premiers of the Puccini's opera Tosca, in 1900 and in 1901. She sang in 1903 the role of Kundry in New York, in the first performance of Wagner's Parsifal outside Bayreuth. She was the second best paid star in the history of Metropolitan Opera: the mezzo-soprano Emma Calvas was earning 1800 American dollars and Trnina 1250 dollars per performance; the earnings of Enrico Caruso, her partner in Tosca, have never come close to those of Trnina. 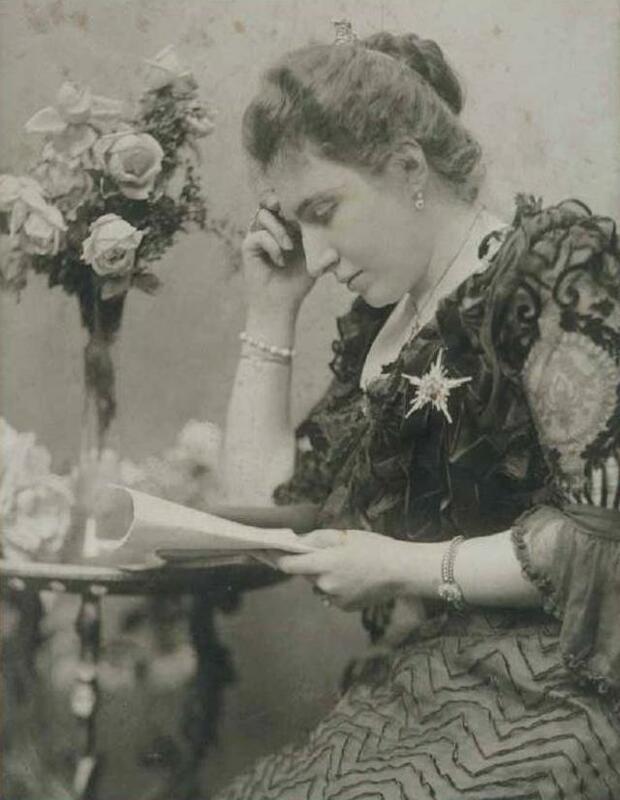 During her career from 1882 to 1906, when she had to withdraw from stage for facial nerve disorder, she sang 64 roles in 59 operas composed by 34 authors. In some operas, especially by Mozart and Wagner she sometimes alternated in two roles. Although she performed in most diverse operas of Italian, German, and French style, she was best known by her interpretations of Wagner's heroines and drew special attention when performing in Mozart's operas. Trnina was unique in tragic as well as in comic roles. Modern composers tried to persuade her to perform in the first nights of their operas and to those who succeeded, great success was always granted. For this reason some of those operas have later never been staged and were forgotten since there was no more that ingenious artist to "carry" the performance. Her colleagues on stage were always the greatest opera stars of the period when opera art was at its peak. Also conductors at those performances were the best of the time, all of whom immensely admired her. Trnina paid special attention to her excellently studied and made, gorgeous costumes; the best were created by Percy Anderson in London. Trnina never recorded her singing on records; there exist only badly damaged life recordings from Metropolitan Opera from the beginning of the 20th century on phonograph cylinders. After she had withdrawn from public life, she dedicated herself to quite, charitable activities. In Zagreb, Trnina attended music life and followed life and work of young singers at the Music Academy with great interest. She recognised only one pupil - a great Zinka Kunc Milanov, to whom she said: "You will be my successor". Milka Trnina has not become silent until today, since the most beautiful falls of Plitvice Lakes that always whirr and babble are named after her. Let us end this text with the words of Milka Trnina: "Artist's life is hard and laborious; if I could come to live once again, and if I would have the choice I would never choose another profession." but only the Croatian national anthem "Lijepa Naša" (Our Beautiful) was sung. 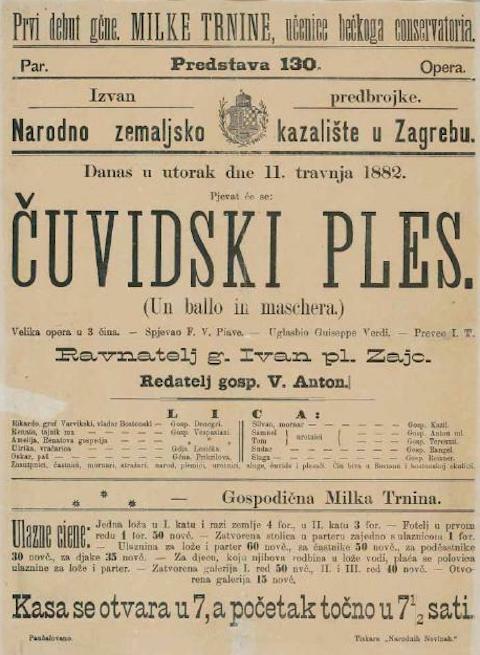 Announcing Milka Trnina as a guest star at the Croatian National Theatre in Zagreb. 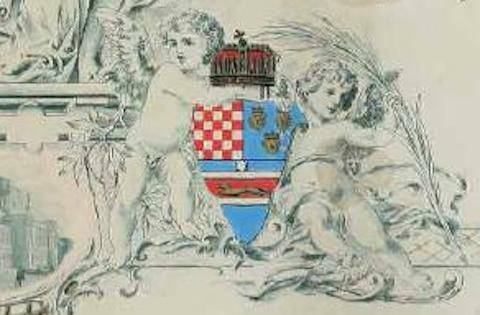 The announcement is accompanied with Croatian Coat of Arms. 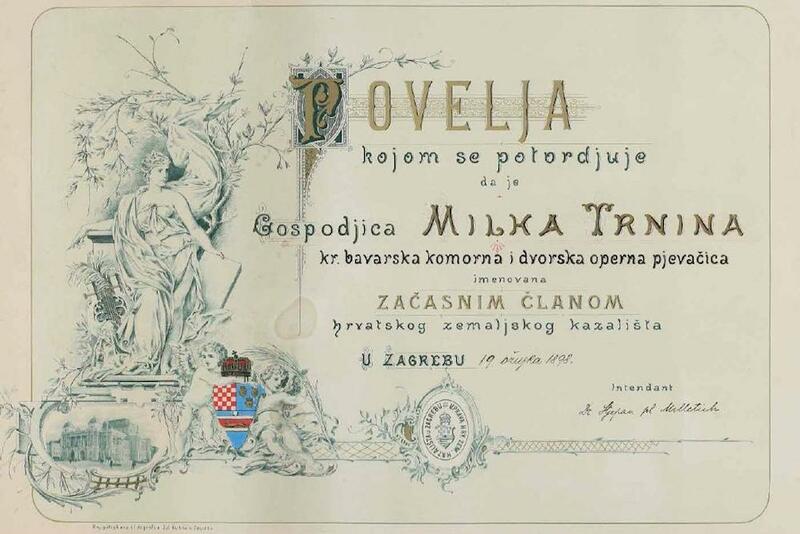 In 1898, Milka Trnina was elected as honorable member of the Croatian National Theatre in Zagreb. Croatian National Theatre on the right is the Opera House in which Milka Trnina started her singing career. for having inspired the creation of this web page.